What’s the Skinny on BMI? It started off as a nice day; going to my primary physician for my semi-annual annual physical. I was feeling good because at 50 yrs. old, I’d been able to avoid medications of all kinds; I was bouncing back from a damaging auto accident, and (knock on wood) had been able to eliminate the genetic equation from my medical reports. They did the typical measurements; weight, height, blood pressure, etc. It was a good exam. There were no prescriptions to get, no new rules to follow; just a pat on the back and a password to the new “patient portal”. It sounded so “official”. I thought to myself in my best Darth Vader voice… I must venture home and explore this “portal”. It must contain secrets!! 🙂 So the next day I logged into the portal and saw my physical report. It had my name, age: 50, Height: 70.5” (5’10.5”), Weight: 227Lbs. and then BMI 32.1 (Obese). So I said, “Golly!! !”, in slightly different language and could not understand what in the world they were talking about. For those of you who don’t know me, I’m now on the backstretch of 51 and weigh 220lbs with an athletic build at 10.5% body fat and a BMI of 31.1. So, nearly 2 years ago at 227lbs., I was around 16-18% body fat. I wasn’t terribly in shape or out of it. And, I just couldn’t see how I could be listed as obese. So, I started doing some research. Here is what I found. BMI stands for body mass index and it is a reference chart that assess how much an individual’s body weight departs from the norm. This chart was developed by the Centers of Disease Control and Prevention (CDC) as a way to determine a person’s health related risk to disease. 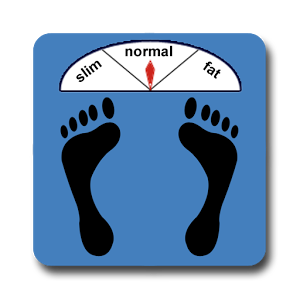 The calculation is simply done by dividing a person’s weight (Kg) by their height (meters)2. 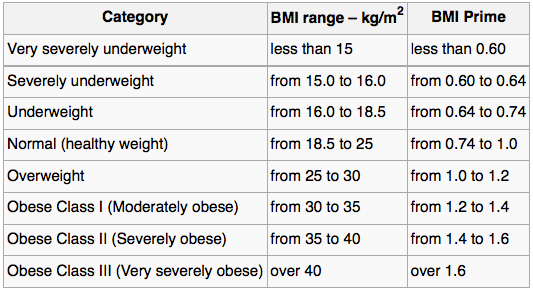 Then the result is compared against the following chart where 18.5 to 25 is considered a normal BMI and healthy weight. Below 18.5 you’re under weight and above 25 you are over weight. BMI Prime is a modification to BMI where it takes the person’s BMI and compares it as ratio to the upper “normal weight” limit (25). So my 32.1 BMI /divided by 25 = 1.284 which meant I was 28.4% above the maximum normal weight. My options then became clear. Either lose 44+ lbs or to somehow grow to 6’ 7”. Regardless, neither option would really work for me. Why was I so concerned? Well, at that particular time I was shopping for life insurance and some companies review your medical records and your reports. Some healthcare insurances also calculate your premiums based on your level of obesity. However, even if insurance companies are not given access to that information, all you have to do is calculate the BMI using the height and weight formula. The visual perception of a 50 year old obese man was not the image I wanted superimposed on me and I didn’t want to be lumped into a category that didn’t accurately reflect my level of health and fitness. Remember, I wasn’t considered to be overweight. I was considered obese. Putting all that aside, it became apparent that BMI is a flawed concept and many factors are not taken into account when using it as a measure of healthy weight. First of all BMI does not take frame size into consideration. The larger your frame is, the greater the weight and higher deviation from the norm. Secondly, lean muscle has higher density than fat and therefore lb. for lb. takes up much less space. BMI is particularly inaccurate for people with athletic builds. The higher lean muscle tends to put them in an overweight category. This inaccuracy affects the results for small framed individuals as well. A person with a very small frame can actually carry a great deal of extra weight (fat) and fall into the normal category. What about the differences in makeup between men and women? BMI does not take any of this into consideration. So why do they use BMI? Quite frankly, the only reason that I have found, is that it is easy. It’s a quick way to generate a number and calculate statistics. Can it be improved upon? Absolutely! Just adding a tape measure around someone’s waist would go a long way in determining an individual’s state of healthy weight. At least then you can track a change in inches. If I were to lose some body fat and gain lean muscle, my BMI will continue to rise. So let’s not even focus on BMI as a measure of health or fitness. It’s unfortunate to have it as a system and it really won’t help guide us on our journey towards health. What is a better way? I never thought you’d ask! 🙂 When I’m training someone or helping them with their nutrition, one of the first things I do is calculate their body fat % (BF%) by doing a 3 or 5 point skinfold measurement with calipers. Now, I must admit that skinfold measurements have an accuracy of (+/-) 3-5%. They however, are a little more practical and cost effective than spending $200-$300 on a DEXA body scan. What the BF% measurement does, is allow me to measure the subcutaneous levels of body fat. This along with your total body weight this allows me calculate muscle or more accurately, lean body mass. This now becomes a system to track weight management and we can see actually where our bodies are gaining / losing lean mass or fat. By the way, our goal (90% of the time) is to maintain or grow lean mass while we drop BF%. I say 90% because typically, long distance runners, tri-athletes, etc. do not want to gain a lot of muscle mass. The American College of Sports Medicine (ACSM) has defined obesity as a body fat percentage over 25% in men and 32% in women. Healthy BF percentages are 10-15% for men and 15-20% for women. Bodybuilders and fitness models will carry less body fat to show muscle definition. 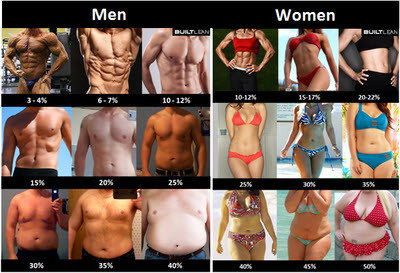 Below is pictorial of various body percentages in men and women (courtesy of builtlean.com). While the accuracy of it is a little in question, the visuals show us a ballpark guide to body composition. So, in closing, let’s not focus on our weight. It’s just a number. If we drink a pint of water, we’ll be a pound heavier but no fatter. Let’s not get caught up in BMI or any other system that lumps all people together as a number as well. If it doesn’t take our individual body composition into consideration, it’s not that useful to us. Let’s instead, place our focus on measuring body fat%. It’s a much more accurate way in calculating healthy weight and it offers a better means of tracking our progress and the response of our body to exercise and healthy eating. Doesn’t this just seem to make more sense? So, stop into the gym and say, “hello!” I usually have my calipers with me. If our paths don’t cross, feel free to leave a message for me at the main desk. In the meantime… Honor yourself. Have gratitude for who you are and for who you’re destined to become. Love your life and live it without limits!! Take care! Michael Rorick is a Certified Personal Trainer at Springville Health and Fitness Center, Springville NY. He is also a Certified Fitness Nutrition Specialist with a Certification in Weight Management as well. His company, Alive Without Limits was founded through his passion for helping others to reach their potentials in all areas of life. At 51 years of age, he is an avid bodybuilder, musician, audio engineer, forensic audio expert, professor at SUNY at Fredonia, life coach, business coach and father.